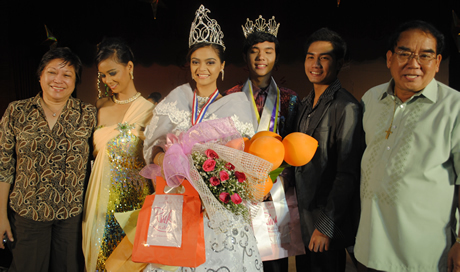 Mr. and Ms. WMSU 2010 with (from left) Dr. Grace J. Rebollos; Alyssa Ciara Kanti, Ms. MWSU 2009; Karen Jared Ilagan, Mr. WMSU 2009; and Atty. Alfredo Jimenez. The Search for Mr. and Ms. WMSU 2010 is one of the highlights the WMSU Grand Alumni Homecoming/Christmas and Sports Festival 2010. The weeklong activity which runs from December 2 to 11, carries the theme “The WMSU Family – On Great Team”. Runners up for the female category were (1st to 4th): Jemuelyn D. Andaya, College of Home Economics; Blanche H. Zapanta, College of Liberal Arts; Cesdianne Z. Daung, High School Department; and Edelyn C. Arguelles, College of Science and Mathematics. Male runners up were (1st to 4th): Jelimar J. Masdal, College of Nursing; Arnold M. Constantino, College of Home Economics; Justine Jay I. Legaspi, High School Department; and Rodaine Awali, College of Education. A talent competition was held on December 2 where Rodaine Awali and Cesdianne Z. Daung were awarded the Best in Talent male and female categories, respectively. A host of other awards were likewise given to various winners during the search night.